Food posts have become a social media currency that is causing us all to gain weight. The adage has never been truer in this society whose people now spend an average of four hours daily scrolling through their Facebook and Instagram feeds, documenting their every move for all their followers to see. What we eat has become a social representation of who we are. In the same way that it matters where weâre seen eating (Does one need a membership to dine there? Does it have an insane roof deck view or a month-long wait list?) and what weâre eating (Does it come from an establishment with long queues at its door? Is it flown in from halfway around the world? Does it have excessive golden flakes on it?). People are now flaunting their food as symbols of their wealth or beacons of a lavish lifestyle, one characterized by constant travels and members-only clubs. And if your #foodporn posts tick off at least one of those items above, then food is no longer merely a material form of nourishment anymoreâit's become a social statement. The more exclusive the food find, the better, in the Instagram world. Although there is no doubt the flavors are interesting and the food items are worth lining up for, they remain icons of indulgence. Instead of stating that you are flying business class on Philippine Airlines, you may simply post a well-curated flatlay of a passport alongside a bowl of arroz caldo and itâs understood. No questions asked. 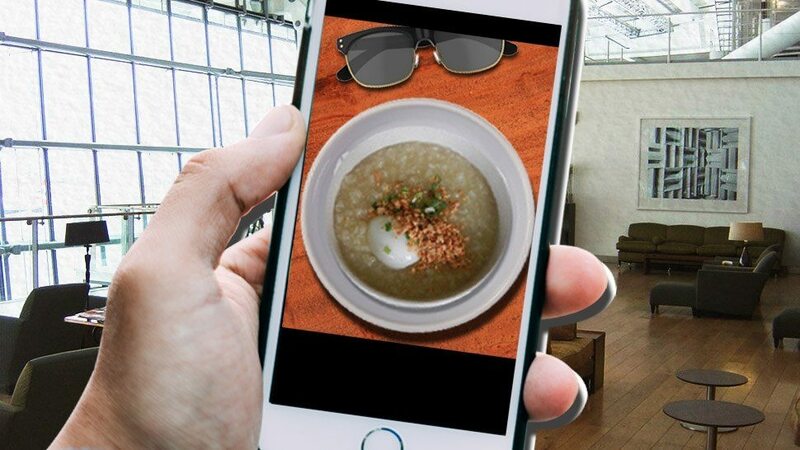 While Instagram Food serves as currency in social media, one simply can't snap and dash. You're expected to eat the dish after spending five minutes finding the best filter for the photo and adjusting its light. Which leads us to another dilemma: The Instagram Food phenomenon is making us pack on pounds. Similarly, it's been scientifically proven that just looking at food, already makes a person hungry. Eating with one's eyes is this generationâs version of gluttony. One who has never flown Business Class on Philippine Airlines may not know that the arroz caldoÂis not served as it is in the photo below. It's served at a bar where passengers ladle their own bowls, with toppings likeÂdilis, egg, garlic, and chopped spring onions available for their choosing. Apart from the Noodle Bar, The Pier also offers a variety of dim sum, which is also as popular. One needs a membership or a referral to enter the gates of Baguio Country Club. Once inside, members gather at the bakery to hoard loaves of raisin and banana bread, among other baked goods. There may be countless other imitations of salted egg chips but a true gourmand would know the Singaporean brand Irvins to carry the original. Some stores sell a maximum of five bags per customer. To get inside ADB premises, non-employees need an appointment and must go through stringent security measures. Only then can one head to the canteen and purchase the chocolate crinkles Spot.ph has named the "best in Manila." The blue tin cans are icons in itself. This gourmet popcorn brand mixes cheese and caramel in perfect sweet and salty combination. The lines go out the door. More than the ramen which is delectable if you have it concocted right Ichiran lures in its customers with the novelty of having a solitary meal in one's own tiny cubicle, undisturbed by servers and those around. You need a Polo Club membership to dine at The Last Chukker, well-known for its crisp brick oven pizza, chicken cooked beneath a brick, and paella, among others. Dubbed the East Coast equivalent of In 'N' Out, Shake Shack has expanded to other countries quicker than the aforementioned fast food chain had. While it has yet to make its way to the Philippines, a trip to the South Korean or Japanese branches may help sate cravings. One needs a membership at the exclusive Manila House to eat at its various food establishments. Fortunately, you're now allowed to take photos and post them on Instagram, something that hadn't been allowed when the club first opened. Even if Porto's baked goods are semi-perishable, Filipinos still take boxes of it back to the Philippines and hand-carry them on the plane. You need to be a member of the exclusive golf club or a homeowner at Tagaytay Highlands to have that hefty steak at the log cabin-inspired restaurant.